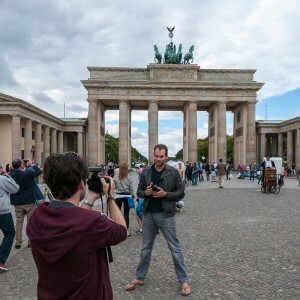 Lee Morris and Patrick Hall, the masterminds behind Fstoppers, one of the world’s leading on-line platforms on photography came to Berlin. On their way to this year’s Photokina in Cologne they are on a road-trip throughout Europe and stopped over here in the German Capital. Their travel party was completed by their friend Igor Alvarez a really cool guy, who has no background in photography, just jumped into this field of action and already showed us some amazing shots. Learning by doing seems to work. Yesterday morning I met them for breakfast under the TV-tower and it instantly turned out that they are not only experts in the photography business but also very humble guys, extremely interested in the history of Berlin (and there is a lot to tell). Later we went to see some historic Berlin around Hackescher Markt, did some shooting and continued conversation. Together with me was Tobias Sens who works as a dance and event photographer taking the guests through the city. They had some idea of what to see and we completed their wishes with some good opportunities to learn and see what Berlin could be like. 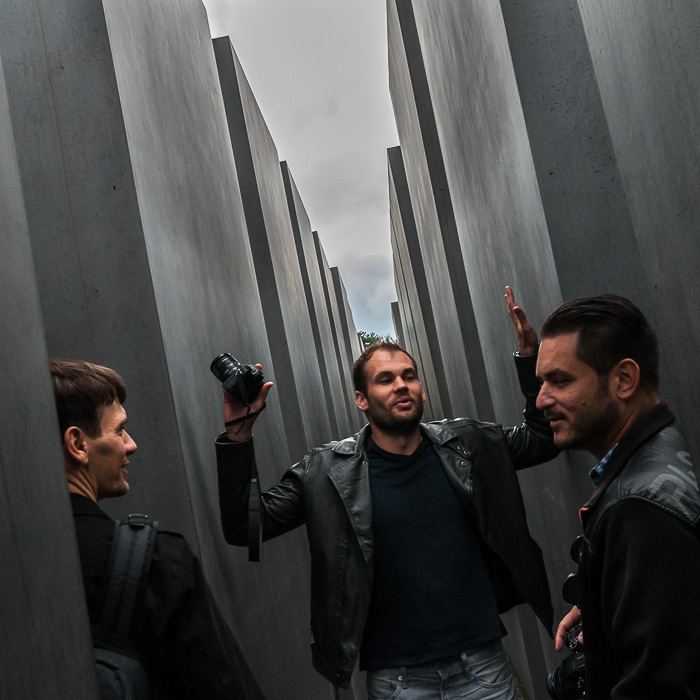 Lee discussing with Tobias and Igor about history at the Jewish memorial. At almost every stop Patrick asked someone of us to shoot him doing his iconic jump in front of some fancy background. Thus we also stopped at Eastside Gallery where he found a lot of these Backgrounds. Right after this we went to the borough of Kreuzberg to show some contrast program compared to all the touristic stuff we saw in the morning. Sitting in one of those grungy coffee shops over a real coffee both Fstoppers continued to share some of their ideas about their own photo business and ofcourse on current developments at Fstoppers and even some rather private topics ;-). But ofcourse the guys also had work. They are about to test a few cameras they did not know before. While Lee was miked Patrick recorded his verdicts on video. Making of: Video shoot for a camera review in front of Brandenburg Gate. For dinner we took them to an Indian restaurant at Oranienburger Straße having some delicous food. I think Patrick, Lee and Igor liked this place even for another reason: finally they had a working wireless lan. Thus they could at least follow the keynote and official specs on Apple’s new iPhone 6 and do some basic facebook communication. At the restaurant we were joined by Dennis Hellwig, a photographer from Potsdam who already knew Lee and Patrick from their last workshop event on the Bahamas. 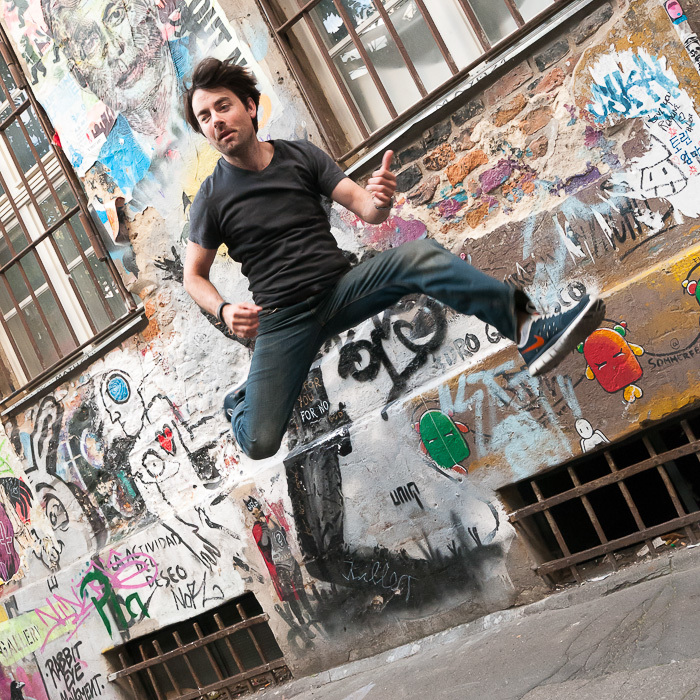 Patrick jumping in front of some collage at a courtyard next to Hackesche Höfe. Meeting you guys and spending a full day with you shooting, talking, discussing and having real fun was just great. Thanks a lot. CU.